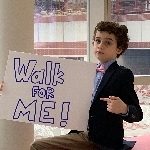 I am raising money and walking to help create hope. Join me on the journey toward a cure for IBD! - IBD is growing at a rapid speed: Inflammatory bowel disease — which refers to both Crohn’s disease and ulcerative colitis — is the fastest-growing autoimmune disorder in children younger than 5. - Too many kids are suffering: Each year, the Center for Pediatric Inflammatory Bowel Disease at CHOP treats more than 1,700 young patients who suffer from abdominal pain, intestinal inflammation and other symptoms of this often-debilitating disease. - To fund the next breakthrough: The past few years have produced an explosion of knowledge about the genetics of IBD and expanded treatment options. Today, expert gastroenterologists, geneticists and researchers work together to evaluate each child’s DNA and microbiome with the goal of developing truly personalized medicine. Join us or donate today and help change and save the lives of children and adults with IBD.